This tapestry "Mappemonde" shows an ancient world map filled with imagery. The work of cartography was both an art and a science in the 17th century. Here in this work, we see an array of scenes of man and gods in natural settings, surrounding the map itself. Rich in detail and vibrant color, this work makes use of blues and burgundies to bring a richness to the work. 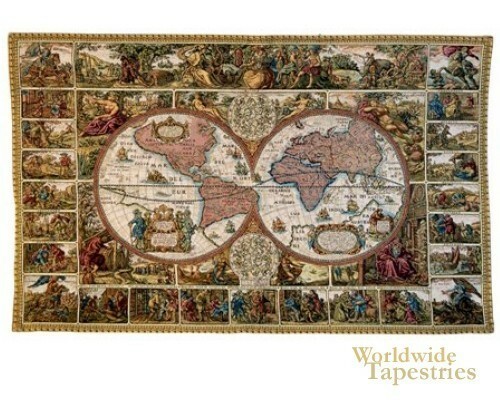 This world map tapestry "Mappemonde" is backed with a lining and has a tunnel for easy hanging. Dimensions: W 43" x H 28"